Matthew Hopkins’ Street Machine Gte ready for re-assembly during his 30,000 mile Pan American tour. If you’re like 7,500,000 other New Yorkers, you don’t own a car. Good for you. However, it also means that when you want to start a bike tour in the region, it is a challenge to get to the start. You can begin riding from The City, but that requires 85 or so of urban miles before you’re singing country roads. If your aim is to ride something like Adventure Cycling’s “Adirondack Park Loop,” it’ll be a few days of riding before you’re even on their map, in Niskayuna, near Albany. Amtrak train service may not always run on time, but it will take you and your bike to the Adirondacks, or the Green Mountains, or Montreal… and that’s a pretty darn good start for a trip in the northeast. Unfortunately, it’s not as easy as simply wheeling your bike onboard. This is doubly-true if your wheels-of-choice are recumbent. Your bike has to fit within Amtrak’s baggage policy. These are the rules as of April 2, 2013. The source for this information is Amtrak’s publication entitled “Baggage Policy” and their website. To verify anything you read here — and you should, in case the information changes between the time I wrote this and the time you travel — contact Amtrak at 1-800-USA-RAIL (800-872-7245) or check Amtrak’s “Bring Your Bicycle Onboard” page. There are ongoing changes in Amtrak policy regarding bikes onboard, so be sure to check their website. Bicycles carried onboard: 50 lbs limit. Standard bicycle sizes apply. Includes bicycles, bike trailers and folding bikes. – Bicycles/bicycle trailers may be checked in a bicycle container for $10.00, in lieu of a piece of baggage. Bicycle boxes are sold at most staffed locations for $15.00 per box. Customers may supply their own bicycle container. – Folding bicycles under the dimensions of 34″ x 15″ x 48″/860 x 380 x 1120 mm will be allowed onboard all trains in lieu of a piece of baggage. They must be considered a true folding bicycle. – Full-size bicycles may be carried on certain trains with designated walk-on bicycle service. Bicycles must be stowed in the designated space within the body of the car. Reservations may be made online or by calling 1-800-USA-RAIL (800-872-7245). – Passengers utilizing the walk-on bicycle service, where bikes are carried on select trains by the passenger and stored in designated areas, must be able to fully handle their bicycle, and be able to lift their bicycle to shoulder height. Passengers are responsible for stowage and security of bicycles. – Recumbent, tandem and special bicycles over the standard bicycle dimensions and will not fit in a standard bicycle box are prohibited. Folding bicycles may be brought aboard certain passenger cars as carry-on baggage. Only true folding bicycles (bicycles specifically designed to fold up into a compact assembly) are acceptable. Generally, these bikes have frame latches allowing the frame to be collapsed, and small wheels. Regular bikes of any size, with or without wheels, are not considered folding bikes, and may not be stored as folding bikes aboard trains. You must fold up your folding bicycle before boarding the train. You may store the bike only in luggage storage areas at the end of the car (or, in Superliners, on the lower level). You may not store bikes in overhead racks. New York City Recumbent Supply sells a version of the Grasshopper fx that fits within the Amtrak size restrictions of 34″ x 15″ x 48″ (86 x 38 x 112 cm). Please note: When traveling on Amtrak, be fully cooperative with the train staff always, even if you don’t like what they say. If they don’t allow you to take a bike on-board, leave the train and take it up with the customer service people. Do not become belligerent; it won’t help you get your bike on-board; it’ll ruin access for cyclists; and it’ll tell me that I should not publish a cool tips like this on my website. Bicycles may be checked on Amtrak between all cities where checked baggage is offered. Not all trains have baggage cars and not all stations are equipped to handle checked baggage. Also, you as a passenger may not be able to travel on the same train as your bike (see wrinkle, below). – The fee for checking a bike as baggage is $10.00. This is subject to change without notice. – Check your bicycle at the station at least an hour before departure. – Bicycles must be partially disassembled to fit in an Amtrak bicycle box. For standard frame bikes, loosen and turn the handlebars sideways and remove the pedals. Amtrak does not supply tools for disassembly. Most recumbents will require a lot more disassembly. And, though it’ll be easier to fit a short wheelbase recumbent in a standard bike box than a long wheelbase bent, neither is a sure bet. Try packing it at home before trying it at the station.- It may be helpful to disassemble and reassemble your bike before your trip to avoid any surprises. Some parts may be especially difficult to remove.- Attach your name and address to the box. Note: Expedition cyclist Matthew Hopkins, who also has 20-years experience as a bike mechanic, dropped by NYC Recumbent Supply during his 30,000 mile Pan American tour. He found the Amtrak bike box far too small for his HP Velotechnik Street Machine Gte (he commented that the Amtrak box seems too small for a fixie). 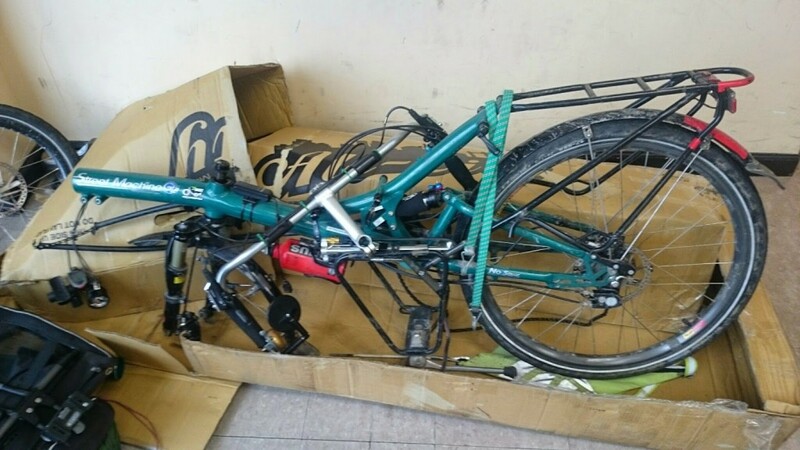 He packed his Street Machine in an airline bike box to take it onto the train. Here is the wrinkle. It is not convenient. And your bike may travel separately from you. Example. You want to go from New York City to Albany and start riding from there. Both NYC and Albany have checked baggage service because there is one particular daily train that runs this route and has a baggage car, however NYC passengers will not be discharged from that train in Albany. Your bike will be discharged, but not you. Train #49 leaves New York City every day at 3:40pm and arrives in Albany at 6:20pm. It will take your bike to Albany (but not you). Train #48 leaves Albany every day at 3:50pm, arrives NYC at 6:35pm. This is how you get your bike back home. In NYC, you will put your bike in a box and put it on train #49. Then you will buy yourself a ticket for a different “commuter” train that will take you from NYC to Albany. In Albany, you will pick up your bike at the Baggage Department, reassemble it, and start riding. 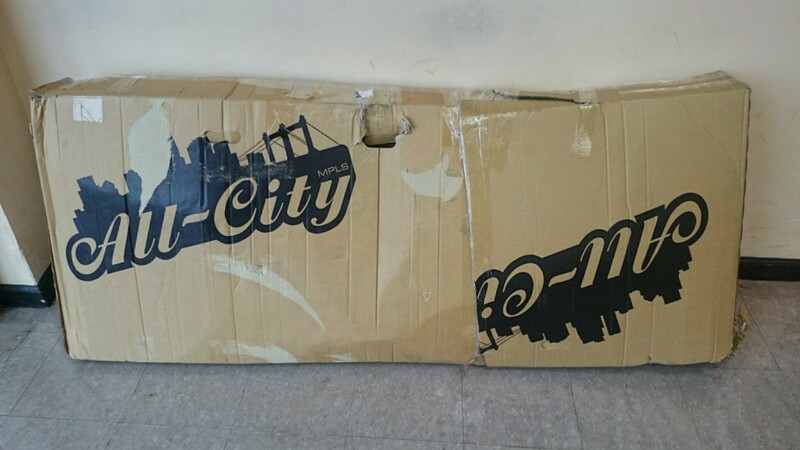 Coming back, you will put your bike in a box on train #48, then buy yourself a ticket on a different train that will take you to NYC, and there you will reclaim your bike from the Baggage Department. Baggage handling fee: $10. Bike box: $15. Your bike has to go into a bike box and fall within Amtrak’s dimensions for checked baggage. If your favorite bent is longer than the dimensions, which may often be the case with long wheelbase bents, install bicycle torque couplings so you can split it into two pieces. A good brand is S and S Couplings. Hire your best local frame builder to install them. If the separated bike still doesn’t fit into one box, then pack it into two boxes and pay for the extra box. I’ve had a few bikes in the shop with S and S Couplings and I recommend them. The following Amtrak trains have walk-on bike service. For trains with reserved bicycle space, bicycle racks may be reserved when booking travel; service fees may apply. Tickets must be supplied when tickets are collected onboard. Passengers are responsible for supplying their own cords and locking devices. Bicycles must be stored in the designated racks. For trains with unreserved walk-on bicycle service, racks are available on a first-come, first-served basis. When the racks are full, bikes will no longer be accepted onboard. Regular bicycles and unicycles may be shipped on Amtrak Express. Bicycles are generally exempt from Amtrak Express size requirements. ← Staying strong through winter, ready for summer.